This Mid-Century Modern inspired sofa (known as "The Carlton") was hand built at our studio in Norwalk, Connecticut. The three cushioned sofa features sleek track arms and firm loose cushions. The solid wood base has a walnut finish. The upholstery is in a soft blue velvet. 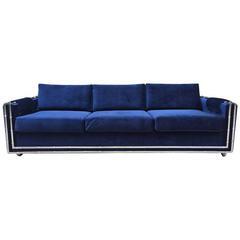 This Classic sofa is being sold as is or can be built to order and customized upon the customers' request. Outside measurements: 34" H x 90" W x 37" D Inside measurements: 16" H x 84" W x 23" D Seat height 20". 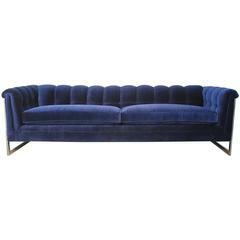 Mid Century Modern, Faux Bamboo Blue Velvet Sofa. Measures: 92" W x 36" D x 30.5" H (to top of back cushions). Fabulous green velvet sofa with tufted back cushion and golden wood frame. Single seat cushion, 8 feet long. Plush and so very comfortable. Solid high quality piece, designer unknown.